Safety is a topic that has been on my mind a lot lately. Ever since Lila (current age 2 years, 1 1/2 months old) drank turpentine thinking it was water, I’ve been keeping my eyes open for more potential hazards. Every house has them, yet as adults we know they are dangerous and avoid them. We rarely, if ever, think about these things as dangerous, and many times it is not until our child gets hurt that we become aware of them again. A child will taste something out of curiosity; they don’t know it is not edible so they put it in their mouth. This is something a baby or toddler has to do to learn about the world around them. Their taste buds are more sensitive than the nerves in their fingertips, so they learn about an object faster through tasting it. The only problem is, they can’t yet taste the difference between something that is edible and something that is not. Start by keeping all poisonous items out of reach. If you use it to clean the house, your car, your laundry, or to kill pests, it is poisonous. The degree of danger varies with each item – some will only cause stomach upset, allergic reaction or vomiting – others can be fatal. These kinds of products are generally labeled as dangerous and will often tell you what to do if swallowed, but don’t count on it. If you have a poison control center in your area, then keep the number next to your phone (or in your mobile, labeled as such) so that you can call for help quickly if need be. The best thing you can do, though, is to keep these items out of your child’s reach at all times. Look for other hazards in your house and do what you can to fix or remove them. Sometimes it can help to crawl around the house yourself so you can see things from your child’s eye view. If they grab that ledge to stand up, is it safe? Will they hit their head or eye on it while standing up? Is it loose? Could it fall off? Ask yourself these kinds of questions as you go from room to room and make a list of what you need to either fix, cover, hide or remove to ensure your child’s safety. You should always know where you baby is playing at all times. With a toddler or fast crawler this can be harder, but is so important. See Random Safety Tips for a list of other things to be aware of with small children. Lila gave me a real scare this afternoon by drinking turpentine. This morning someone came by to drop off a box with paint and supplies as we are going to paint the house soon. I had it placed in the guest bedroom (which is also where the balcony is; the kids go in the room all the time) and left it there as it didn’t fit under the bed. I didn’t check the box closely and never noticed the bottle of turpentine sitting there. I don’t know if it was open or closed, though it must have been closed or else I would have smelled it. Around 3:30 p.m., Logan and Lila were running around playing. They had skipped their nap and were rather wild. Scarlett was fussy, only wanting me to hold her and not letting me put her down. Logan and Lila were playing on the balcony and running in and out of the house. Next thing I know, Lila dropped something and was coughing. I smelled it and immediately got scared, not knowing what I should do, only that I had to do something fast. I picked her up and tried to wash her mouth out, then I thought maybe she should throw up. I didn’t know how much she had swallowed. I’m guessing a mouthful. She was coughing and spitting, and I was almost frantic until I saw how scared Logan was. He was crying and freaking out like he does when he sees someone else freak out. Somehow it affects him. It didn’t help that Scarlett was screaming for me either. Then I remembered our neighbors downstairs. Both our landlord and his son are paediatricians, so I grabbed Lila and the bottle, told Logan to watch Scarlett, and ran downstairs to see who was home. Our landlord was out so I ran to his son’s place hoping he was home. Thank God he was. His wife immediately sent her daughter, who sometimes plays with my kids, up to our place as both Logan and Scarlett were crying. The main thing he said was that she shouldn’t throw up to avoid getting it into her lungs, then to give her milk. I have heard of that before; it seems to help neutralize the poison. He said if I took her to a hospital they would do an x-ray to make sure her lungs were clear, then tell me to watch her, make sure she was breathing ok, etc. He wasn’t freaked out about it, which helped me calm down. So I took her upstairs to try to get some milk into her, since she wouldn’t drink what his wife gave her. On top of it I had to try to calm Logan and Scarlett as well. I sat Lila in front of the t.v. and she had a few sips of milk while I distracted Scarlett. Soon she got into the cartoon and I was able to put Scarlett to sleep; then Lila got tired and took a nap on the couch. I was finally able to turn to Logan and give him some attention to help calm him down. After her nap, Lila was fussy but seemed to be ok, until she threw up during dinner. She hadn’t wanted to eat so was on my lap when it happened. Logan again freaked out, probably more due to his own tiredness, so I put him in his room to cut some of the noise since all 3 of them were crying again. He eventually fell asleep. After a quick bath, both girls fell asleep on my lap in the space of 5 minutes, Scarlett nursing and Lila cuddling. Peace and quiet ensued, and it was only 9 p.m. This is unheard of in our house. It is now 10 p.m., all the kids are still sleeping, and I finally have a chance to reflect on the events of this afternoon. I really should have checked the box. Lila gets into EVERYTHING these days and is accustomed to helping herself to water from the bottles in the fridge. So she assumed it was water and drank it. Good thing I was right there when it happened so I could help her right away instead of trying to guess what had happened. I have now closed the box and put something heavy on it to at least hinder her from getting into it until we can find a safer place to put it. Ahhh, the things children do to keep us on our toes and test our nerves! Safety – it is so important with children, yet is so easy to take for granted. I know I do it sometimes. Even though I know something, I will ignore it, thinking the worst will never happen. As mommies, we can never be too careful with our children. This doesn’t mean we should freak out at the slightest thing, but we should always be on the lookout for dangers in order to protect those in our care. Yesterday I was playing with the children on the roof. Scarlett had been in the walker for a while but got fussy, so I picked her up and was following the other two around as they ran from one side to the other. While standing by the edge looking over, out of habit I made sure to hold the baby away from the edge and that got me thinking: how many things do I do that are good safety rules to remember that others may not be aware of? So here is a list of safety tips, in no particular order. – Always check when closing a door that your child doesn’t have her fingers there. Often children will stick their fingers where the hinges are and get them jammed there. – When on a balcony, roof, or any place that is above the ground, never hold your baby near or over the edge. It is too easy for a child to wiggle and be dropped. – If you have a balcony where your child plays (or even if they don’t) make sure the rails are not wide enough for them to get their head through. 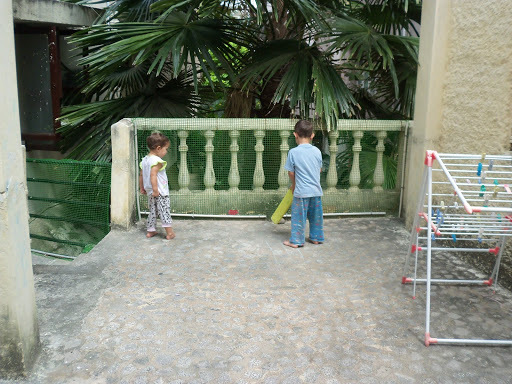 Our balcony has gaps large enough for my kids to just slip through, so when we moved here, we had the whole thing covered with a plastic-coated wire mesh, so that they can still look down but can’t fall. – Put the crib down to its lowest level as soon as your baby can pull up into a standing position, otherwise they could fall out of the crib. – Don’t let a child play around your feet when cooking. They could trip you and you could drop a pot or hot food on them. A baby could watch from their highchair, or a toddler could sit at the table if they must be near you. Otherwise, it is safest for them to not be in the kitchen, especially near the stove, while you are cooking. 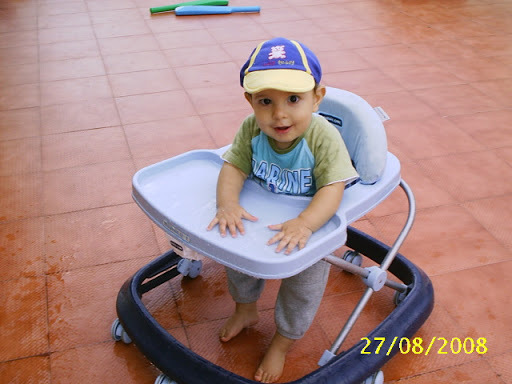 – If your baby is big enough to stand up in her highchair, make sure to strap her in. Otherwise she could stand up and fall. – Only buy safe toys for your baby. A safe toy is one that does not come apart into small pieces that could easily be swallowed, can be tasted without paint coming off, doesn’t have any sharp edges. Fisher Price makes safe baby toys that don’t break. Logan has had some trucks since he was tiny that have been dropped, banged, thrown, sat on and stepped on, but have never even cracked. If you have an older child who has smaller toys (i.e. Lego, doll accessories , make sure they put them out of the baby’s reach when they are done playing, or play with them somewhere the baby can’t get to – a bed, table, etc. – Watch out for anything with a string attached, skipping ropes, belts, plastic bags, balloons, cleaning supplies, medicines, vitamins, matches. All these items can be dangerous or fatal! – Since a baby puts EVERYTHING in their mouth, check your floors daily. Don’t assume they won’t try it. Choking is something that can happen when you least expect it, so be aware and on guard at all times. If it fits in their mouth, they will try it. Watch out for coins, nuts, hard candies, seeds, small toys, etc. – Staircases can be fun to climb but so dangerous to fall on. Have a safety gate in place to keep adventurous crawlers and climbers off of them, but do also teach them how to go up and down safely. The earlier you teach this, the better. You can teach your baby how to crawl down feet first, and when they start walking, how to hold the rail to go up and down. – Watch out for edges of furniture and corners. If they fall on it, they could seriously injure themselves. You can put foam padding on corners, and store anything that could break (like that lovely glass coffee table) until they are older. Also, teach your child to look when standing up, especially if they like to play under the table, so they learn to not hit their heads all the time. – Once your child is able to open doors on her own (usually around two years) you may find it necessary to lock doors you don’t want your curious toddler opening. You can put a lock on the outside of any door, high enough that they can’t get it. Be aware that if you often climb on chairs to reach things, they will try the same, so put the lock well out of reach. And don’t just lock rooms that could be dangerous. Put it on any door (including closets) that you don’t want them to open. For low cupboards you may need locks that need a key to open, or special child-proof locks. I’ve heard of people who had older children (3-5 years) who would open the front door at night and get out. If your child tries this, you will need a high lock on all house exits, something that they can’t open. – If you can’t lock things up, then put any item you don’t want them to touch out of reach. It will save you from having to say no 1,000 times a day. – Sharp items (knives, scissors, nail files, etc.) should always be kept out of reach. 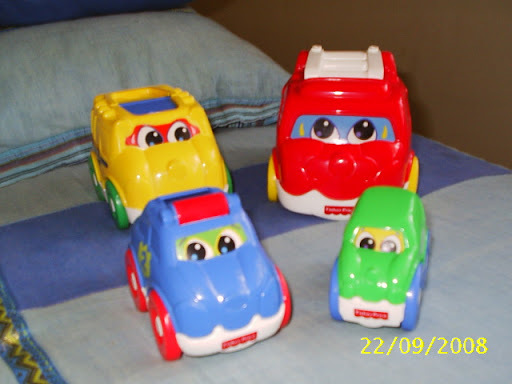 – Teach your child road safety early. You don’t have to wait until they go to school; start when they learn how to walk by holding their hands when crossing the street, etc. Scarlett started using the walker about 10 days ago. She still doesn’t go anywhere in it except backwards at times. I know though that it won’t be long until she will be racing around the house in it. In case you’re wondering, it’s normal for a baby to go backwards first and then learn to go forwards. They seem to also do this when learning to crawl. People have asked me if I think a walker really teaches a baby to walk or if it is just another useless piece of baby equipment that shops try to convince you that you need. Why get it if they will learn to walk anyway, right? I don’t think a walker teaches walking at all, but it does give you a place to put the baby where they can sit upright and move about on their own. Babies need to explore, to move about, and they get frustrated and fussy if they are confined. 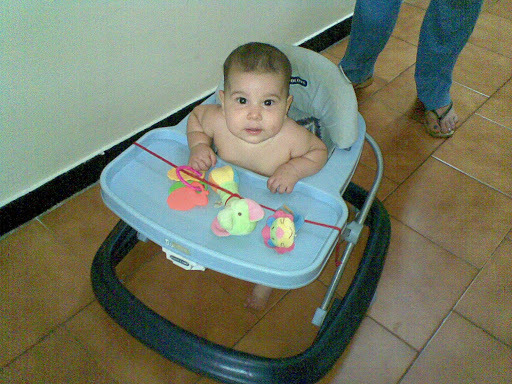 To give you an example: Logan started using the walker early, at nearly 6 months old. He could barely touch the floor at the lowest setting, but as soon as he learned to move it on his own, he was off. He loved being able to move about on his own and follow me from room to room. He used to do this cute hop with both feet and got to where he could move the walker at lightening speed. Logan didn’t crawl until he was 11 months old. During those months, he was happier in the walker than on the floor. He would get frustrated if he couldn’t move around and would fuss a lot. Of course I did put him down at times so he could learn to crawl, and he eventually did figure it out. I still used the walker for him until his first birthday; then he preferred crawling, and learning to stand so he didn’t need the walker any more. For him, the walker made a difference. It kept him happy and gave him greater freedom of movement. I say walkers are useful; just don’t expect them to actually teach your baby to walk. – Never use them at the top of a staircase unless you have a safety gate in place, one that will be impossible for your baby to learn to open on his own. Make sure the gate swings toward you instead of down the stairs for extra safety. Even then, know where baby is at all times, just in case someone else was to leave the gate open. – Make sure that if low cupboards are in the baby’s reach, they can’t be opened by little fingers, otherwise baby will open them out of curiosity and ram the walker into them, squishing his fingers. The same would apply to any room door when baby is in that room. You can always prop doors open, or else close them to keep baby out. – If your walker doesn’t have an activity tray, you can tie some toys to it. Just make sure you use a strong piece of string, something that will be ok for baby to chew on (such as a tie from a pair of track pants), slip the toys on, and tie securely on the other side. Make sure the string is taut and that baby won’t be able to get it over his head; also make sure it is tied securly so that it won’t come undone. – Make sure the walker is locked in position when you change the height level, otherwise it could collapse, injuring your baby. – Your baby will be able to reach things they couldn’t before. Watch out for tablecloths (can be pulled down), electrical plugs (use large pieces of furniture to make inaccessable, or cover with special plastic inserts), and any furniture or ledges that would be at baby’s head level. Move up anything that you have on low tables that could be broken or that would be dangerous for baby to play with.